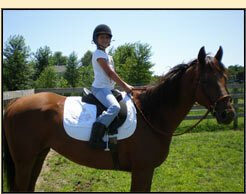 Bridgette's summer horseback riding camp is a great way for kids to learn in a fun and natural way. Horses offer students the opportunity to learn many important things such as learning to become aware, respectful, appreciative, confident, and to learn to deal with fear, apprehension and how to better communicate and become a leader. We have four different levels to choose from. From the beginner who has never had a pony ride to the serious showing student. We have camps to meet everyone's needs. Extended Hours are available for your convenience. Lunch, Drinks and Snacks are provided. Two riders are teamed up to care for one horse. Riders will learn all that is entailed with taking care of a horse on a daily basis, along with Riding Lessons, Safety, Grooming, Tacking, Feeding, Bathing and Handling. We also play lots of Games on Horseback, Fun Crafts, Water Games, Mini Horse Show and much more! Jumping Lessons, Dressage Lessons, Advanced Horse Training, Softening Exercises for Your Horse, Ground Work, Obstacle Course, Drill Team, Riding Games, Trail Riding, Roping and Horse Care. $50 Administration Fee for all withdrawals. Please try to register at least 3 weeks before camp date to ensure availability. If you have your own horse you may bring him to camp! Board is free! I would like to welcome you to our groups and troops program. We are a small working farm dedicated to teaching people how to take care of and ride horses. We believe that a good foundation is one that teaches the students how to work with the horse's nature. Our program is a great introductory for all of our future potential horse trainers, riders, veterinarians and animal caretakers! Lesson is one hour long. Cost is $25 per person. The length of lesson can be tailored for your group! We usually suggest coming twice for 1 hour. For more information call Bridgette at 516-425-0693. This is a great alternative for families that don't want or can't afford to send their child to horse camp. Parents are required to pay for one riding or ground lesson per. visit. This lesson gives your child the tools he or she needs to safely work around and ride horses. A trained adult will be present during volunteer hours 8:00 a.m. till 2:00 p.m. Fridays and Saturdays. Drop off and pick up at your convenience within these times. Lessons are one hour long and cost $70. Kids will learn how to groom, hoof care, halter, lead, saddle, bridle, clean stalls, paddocks and the basics of how to run a farm. I strongly believe that one-on-one training is generally the best way to learn! However, beginner students, when in a group setting, seem to progress much faster than when learning alone. Watching each other seems to inspire, motivate and build confidence in a super easy way. This program is designed to bring you as far as it can without compromising quality. This class will take you right up to the point where private lessons should begin. Group is 4-6 people.